Adekeye, A., Akintayo, C., Enye, L., Ogendengbe, O., Adeniyi, A. (2015). Histochemical Evaluation of the Activities of Vitamin C on Ethanol Administration in Rat; Implication on the Cytoarchitectural and Some Neurochemical Indices of the Prefrontal Cortex. International Journal of Advanced Biological and Biomedical Research, 3(1), 10-13. A.O. Adekeye; C.O. Akintayo; L.A. Enye; O.O. Ogendengbe; A.I. Adeniyi. "Histochemical Evaluation of the Activities of Vitamin C on Ethanol Administration in Rat; Implication on the Cytoarchitectural and Some Neurochemical Indices of the Prefrontal Cortex". International Journal of Advanced Biological and Biomedical Research, 3, 1, 2015, 10-13. Adekeye, A., Akintayo, C., Enye, L., Ogendengbe, O., Adeniyi, A. (2015). 'Histochemical Evaluation of the Activities of Vitamin C on Ethanol Administration in Rat; Implication on the Cytoarchitectural and Some Neurochemical Indices of the Prefrontal Cortex', International Journal of Advanced Biological and Biomedical Research, 3(1), pp. 10-13. Adekeye, A., Akintayo, C., Enye, L., Ogendengbe, O., Adeniyi, A. Histochemical Evaluation of the Activities of Vitamin C on Ethanol Administration in Rat; Implication on the Cytoarchitectural and Some Neurochemical Indices of the Prefrontal Cortex. 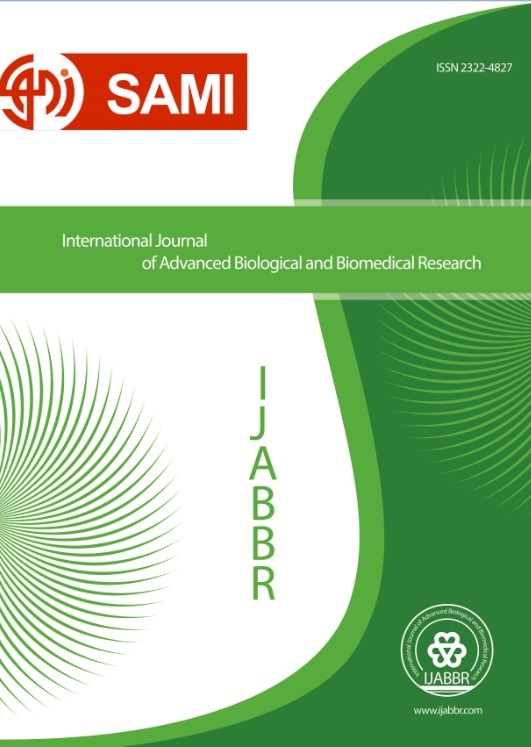 International Journal of Advanced Biological and Biomedical Research, 2015; 3(1): 10-13. Objective: This study was to evaluate the effect of Vitamin C on the histology and histochemistry of the prefrontal cortex of ethanol-induced rats. Methods: Male Sprague-Dawley rats were used for the study. Ethical approval was obtained from the University’s ethical committee. The rats were randomly divided into 6 groups of 10 rats each. Rats in group A= free access to normal saline. Rats in group B= treated with 4.25 ml ethanol. Rats in group C= treated with 100 mg/kg Vit. C. Rats in group D= pre-treated with 100 mg/kg Vit. C followed by 4.25 ml ethanol. Rats in group E=co-treated with 100 mg/kg of Vit. C and 4.25ml ethanol. Rats in group F=post-treated with 4.25ml ethanol followed by 100 mg/kg Vit.C. 24hrs after the last administration, the rats were sacrificed by cervical dislocation: the fraction of the brain for tissue histochemistry was fixed in formol calcium and later processed for Heamotoxylin and Eosin with Cresyl fast violent staining techniques and the other fraction meant for enzyme and/or marker histochemistry was processed accordingly for some neurochemical indices for oxidative stress. Results: The markers of oxidative stress were statistically increased in the rats in group D, E and F compared with the rats in group B. There is a significant reduction of TBARS when compared with ethanol induced group (group B). The histological profile of the prefrontal cortex of rats in group A and C were preserved while that of the rats in group B displayed distorted cytoarchitecture profile with a marked increase in apoptotic bodies, lateral deviation of neurons and a marked increase in the activities of oxidative markers.